Located 12 miles off the northeastern coast of the Yucatan Peninsula, Cozumel (pronounced koh-zah-MEL) is the largest inhabited island in Mexico, at 30 miles in length and 10 miles wide. Long sandy beaches line the coast, and are met on the western side by the gentle waves of transparent blue waters. Cozumel is known for some of the best drift diving in the world; the fast moving Yucatan currents bring a constant wash of plankton and other nutrients to the amazing reef system, and feed as many as 250 different species of fish, sea turtles, rays, sharks, corals and sponge formations. How does 200-foot visibility sound? Just where you want to be? Well, if you are looking for diving that is a little different, you are looking at the right place. On the Yucatan Peninsula in the Mayan Riviera, which is only a ferryboat ride away from the island of Cozumel, you can experience the beautiful fresh water "cenote" caverns. The Mayans believed the fresh water pools to be portals to a spiritual world beneath. You will not find fish here, but you will find beautiful stalactites. It is an experience that you definitely do not want to miss! Cozumel is located in the Central Standard Time (CST) zone, and the island does not observe Day Light Savings Time, as is done in the U.S. The national language of Cozumel, Mexico is Spanish, although you will find that English is widely spoken. 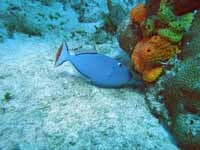 Diving in Cozumel is great all year long due to the Gulf Stream currents that bring good visibility. Cozumel has an annual rainfall of approximately 40 inches, creating a tropical climate with average air temperatures around 80F, with a relative humidity of 75%. Average water temperatures range from 77F to 82F, and water visibility ranging from 80 to 100+. Continental, US Airways, Mexicana/AeroCaribe, Northwest, and American serve Cozumel and Cancun airports from destinations all over North America and Europe. There are non-stop flights available out of Houston and Dallas, Texas. When flying into Cozumel, taxis are available at the airport, as well as rental cars. Avis, Budget, Hertz, and National are the available rental car companies located in the airport. For your convenience, foreign and international licenses are accepted. U.S. Auto insurance is not valid anywhere in Mexico; therefore it is strongly recommended that you purchase Mexican auto insurance. The insurance is inexpensive, and can be purchased for a day, week or month; all you need is a copy of your current vehicle registration and a valid driver's license. Having this insurance will help avoid detention in Mexico incase of an automobile accident. * Take an hour air-conditioned bus ride from the Cancun Airport to Playa del Carmen, where you will pick up a passenger ferryboat, which will whisk you over to Cozumel Island in about 35 min. The ferryboats are nice and air conditioned, with comfortable seating & music videos. The cost for the bus is about $10.00 one-way, and the ferry is about $17.00 US round-trip. * In the alternative, you can hop on a commuter plane for roughly 20 minutes from Cancun to Cozumel. The cost of the commuter plane averages about $120 round-trip, plus taxes. When entering/exiting Cozumel, US and Canadian citizens must provide proof of citizenship (i.e. passport) and a return ticket. Visitors from other countries do require passports and a visa, as well as roundtrip tickets. Non-Mexican citizens must fill out a tourist card upon entering the country, which costs about $20.00 (U.S.) and can be obtained at any Mexican consulate, Embassy, border crossings, or automobile clubs (AAA). When flying into Mexico on a stay over seven days this fee is generally included in the cost of the airline ticket. The tourist cards are valid for 90 - 180 days and it is not a working permit. Cozumel's local currency is the Peso, with an exchange rate that fluctuates daily. While vacationing in Cozumel you can exchange traveler's checks, or other world currencies at the local bank or money exchange houses. For your convenience, there are ATMs located in most tourist areas through Cozumel; do note that the ATMs will only dispense pesos. U.S. Dollars can be spent throughout Cozumel, however be prepared to receive change in pesos. The most commonly accepted credit cards are American Express, MasterCard, and Visa. Most resorts within Cozumel offer international and national direct dialing from the hotel rooms, utilizing the local telephone company; however sur charges usually apply. The city code for Cozumel it is 987. There are public payphones located throughout Cozumel, which are capable of making international and national long distance calls. Phone cards can be purchased from many small shops with $ 20, $ 50 or $100 Pesos calling time. If you plan on using your cell phone while traveling, check with your provider to find out if your phone works in Cozumel, and whether you have international calling included in your plan. Electrical output on Cozumel is 120 volts, 60 cycles, and generally compatible with American appliances. There are no required or suggested inoculations needed to enter Cozumel. Yellow fever and Malaria are not of issue in Cozumel. For more information on traveling abroad, contact the Center for Disease Control in the US. http://www.cdc.gov/. In the event of a medical emergency, Cozumel has several hospitals and health clinics available in the cities. The drinking water in Mexico is not palatable in most places, therefore, it is suggested that you order bottled water, even when eating at restaurants. It is also recommended to use caution when purchasing food from street vendors.